Day 166: Shall we Dance? I'll meet you at the Spanish Ballroom. Whether you’re a skilled dancer or a brand new student of dance, Glen Echo Park has a dance party for you! Thursday, Friday, Saturday and Sunday evenings, you can put on your dancin’ shoes and cut a rug with your neighbors and friends. Dance experience is NOT required and in fact, neither is a partner! Just come on down to the ballroom. And if you’re a little inexperienced and perhaps nervous about that, never fear. Free, pre-dance introductory lessons are offered before the social dances begin every evening. Enjoy the chance to learn something new or hone your skills with American swing, blues, salsa, waltz or traditional American contra & square dancing. 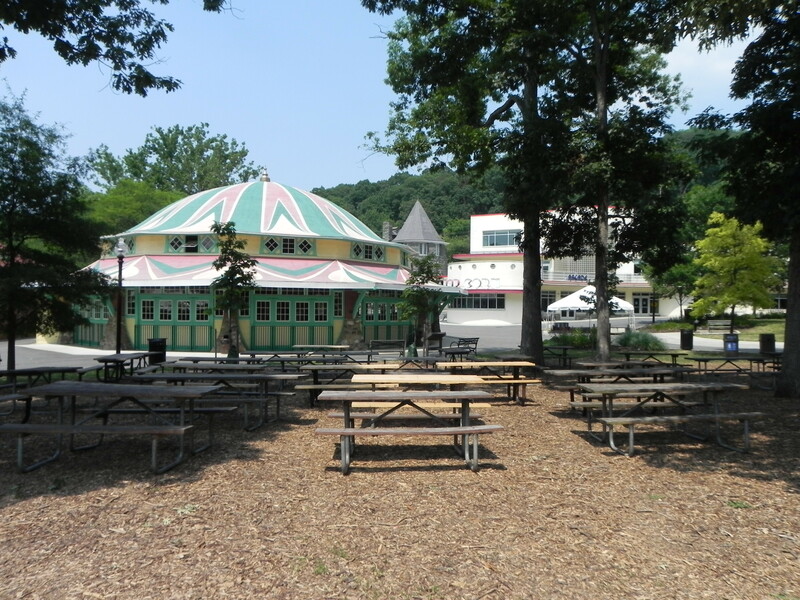 The social dances at Glen Echo Park are held in perhaps one of the most the beautiful venues in the area. The Spanish Ballroom is, in particular, one of the finest and most elegant of the dance facilities. You will also find dances offered at the Ballroom Annex and the Bumper Car Pavilion. The historic Spanish Ballroom was built in 1933 in a Mediterranean, art deco style offering a glamorous place for up to 800+ people to gather and celebrate. After passing through its grand foyer, you emerge into the open ballroom with its arched windows all around. A Baby Grand piano sits upon the stage overlooking the gorgeous hardwood dance floor. The building is flanked by its gracious promenades. It’s a pleasure to walk into the room with live band music energizing the room and the dancers floating across the floor with broad smiles. One note of caution: the ballroom is a stunning venue for large parties and events but the building is neither heated nor cooled so come prepared. If you plan to rent the facility, the best times for comfort are in the spring and fall of course. In the meantime, stop by on some nice summer evening and enjoy a social dance party. All dances are open to the public for any age and you can dress casually. Admission cost various but typically ranges between $5 – $20 – including the pre-dance lesson. Sometimes you will find that there is more than one dance party going on and you can try your skills at two dance styles in one evening! A full schedule of dance parties can be found on the Glen Echo Park website. The year is 1926. Silent movies are the rage. Route 66 is created spanning from L.A. to Chicago. Winnie the Pooh is published by A.A. Milne in the UK. A first-class stamp costs $0.02 and the unemployment rate is 1.8%. America is enjoying The Roaring 20’s wearing their zoot suits, fedoras, head bands and wing-tip shoes. The wealthy cruise around in their Model T Fords. And in Glen Echo Park, visitors throng to The Skooter for an exciting ride on the bumper cars! Its art deco facade was added in the 1930’s and the ride was then renamed The Dodgem. 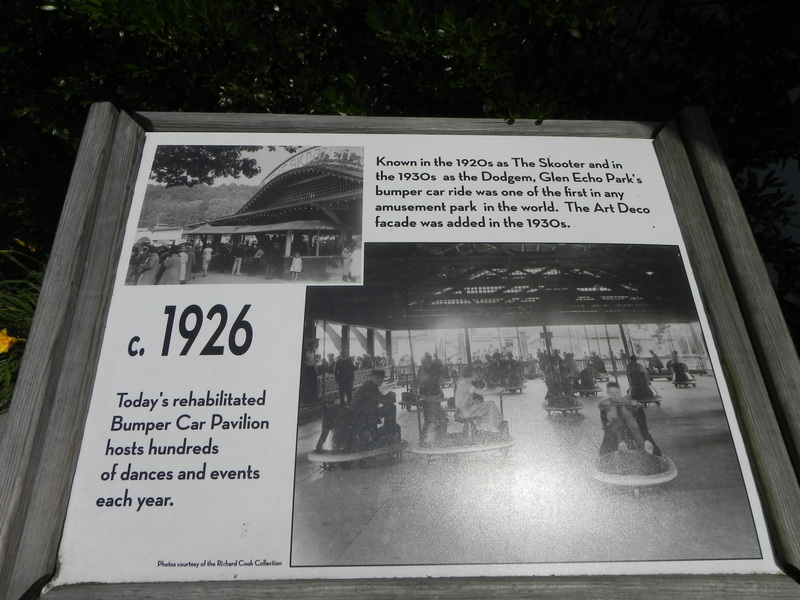 Today, the Bumper Car Pavilion still stands. While you no longer find the good ole’ bumper cars bustling about, the building now serves the community as an ideal venue for dances, wedding receptions, bar/bat mitzvahs and private parties. The building is open-air and therefore neither heated nor cooled. It does offer a sound system and stage as well as clear, retractable plastic sidewalls for inclement weather. Groups from 20 – 200 can be comfortably accommodated for dinner and dancing and up to 350 for a standing-room-only event. Over 400,000 people a year visit Glen Echo Park and enjoy the opportunity to take in dance and art classes, festivals and educational programs of all kinds. Once the area’s premier amusement park, Glen Echo Park has a diverse and interesting history that continues through to this day. The area began in 1891 as an arts and education colony – the National Chautauqua Assembly – featuring band concerts and exciting speakers every night of the week except Sundays. According to William Offutt’s Bethesda, A Social History, “by 1893 concerts echoed through the trees at Glen Echo [Park] almost every summer weekend.” Because it was situated at the terminus of the trolley line, Glen Echo Park became a destination for the upper crust of D.C. The vaudeville shows were a hot ticket as were operas and other social events. In the summer of 1899, a band pavilion, bowling alley and the merry-go-round were installed and the area became an even more popular destination attracting crowds numbering in the thousands. In the early 1900’s, roller coasters were installed (much to the chagrin of area residents such as Clara Barton). On any given summer day you could find as many as 5,000 people visiting the park. In the 1930’s, in addition to its roller coasters, merry-go-round, popcorn and cotton candy concessions, hall of mirrors, chain-pulled boats through the Tunnel of Love and dance hall, the Park added the Crystal Pool! Measuring 150 X 250 feet the pool was a huge attraction with a diving pool, two swimming areas, a wading pool and a sand beach plus a huge locker room. Bethesda residents spent entire summers at Glen Echo Park enjoying the delights of what was called “The Cleanest Park in America in 1940.” The art deco entrance to the park was added in 1940 near the trolley tracks and remains there today. Two World Wars, the Great Depression and the civil rights movement hit the area hard and there are many personal and public stories detailing events that changed the face of the Park and the community as a result of these challenging times. In 1971, it became a National Park and is the only amusement park preserved by the National Parks system. Today, Glen Echo Park is preserved through the combined efforts of the National Park Service and Montgomery County. 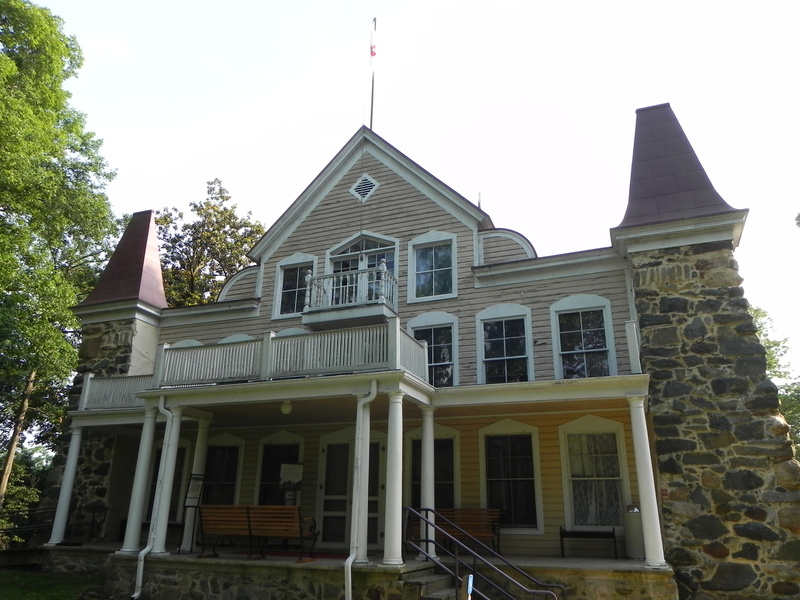 Together, in 2002, they formed the Glen Echo Partnership for Arts and Culture as a non-profit organization that manages the programs and facilities of the Park and preserves its natural history. This rich and fascinating historical site is definitely worth a visit for a day, for a weekend or regularly for the many activities it offers. Because it has such a rich program and history, we will feature a different part of the park each day this week on Bethesda365.com. We also encourage you to stop by the Park on a Saturday or Sunday at 2 PM and enjoy a 45-minute park tour to better appreciate the rich background and diverse array of current-day programs and events that are offered there. The tour meets at the Visitor’s Center. Or just stop by some time and have a picnic, walk the grounds and take a ride on the very quaint old carousel. If you’ve ever traveled west on MacArthur Boulevard past Wilson Lane you will come to a stop light at a curious one-lane bridge. Curious because in this day and age of the super highway the idea of stopping for traffic on an ancient bridge while cars pass by single file seems absurd. The next time you sit at the light patiently waiting your turn you will probably now think of the story behind this bridge. The story behind the Cabin John Bridge, also known as the Union Arch Bridge, is anything but absurd. A few years before the outbreak of the Civil War, the world’s longest single arch bridge was being designed to span Cabin John Creek. The bridge was completed during some of the most tumultuous and defining times our Country has ever experienced. From the start of construction in 1857 to the completion of the bridge in 1864 our nation was literally being ripped apart from the inside out by Civil War and yet, a marvelous bridge was being built with great ingenuity, labor and skill. The bridge sits 100′ high above the meandering Cabin John Creek below and spans over 200′ from the east to the west embankment. Through the center of the bridge runs the Washington Aqueduct which provides fresh water from its source at Great Falls to its destination in Washington, D.C.. Since the bridge was completed the Aqueduct has been in continuous operation. With the onset of suburban living in the late 1800’s and early 1900’s, social networking was changing. Living in the “burbs” made it more difficult for the folks to stay in touch and enjoy social activities like they did in the cities, especially during the long, cold winter months. As a result, groups such as literary guilds, citizen associations and women’s clubs began to assemble to fill that social gap and bring people together for fun and to support civic needs of the community. 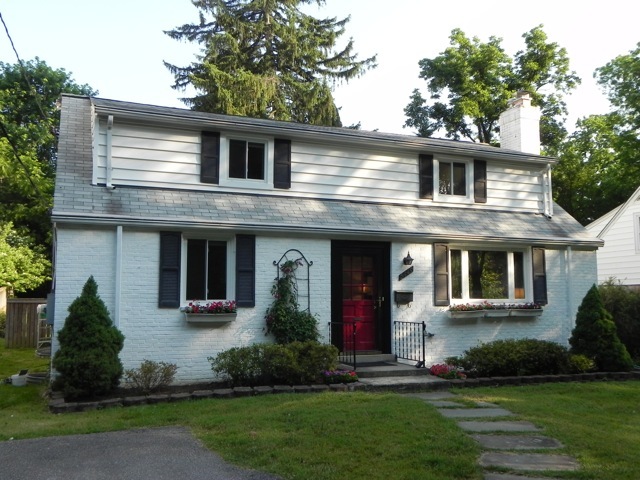 In the home of one of its charter members, The Woman’s Club of Bethesda began in 1911 and adopted its motto, “An earnest club for earnest women.” In 1927, the club moved to its current location off Old Georgetown Rd. This year, The Woman’s Club of Bethesda celebrates its 100th anniversary and although the club has seen many changes over its 100 years, it still continues its tradition of wonderful women contributing their energy and resources to our community and to many worthy causes such as college scholarships, women’s shelters, Habitat for Humanity, crisis centers, food banks and more. Their website shows a complete list of the charities and causes they supported in 2008. Much of their philanthropic efforts come from the monies they earn by renting out their facility – and what a wonderful venue it is! Outfitted with hardwood floors, the large meeting/ballroom is ideal for dances and/or large dinner events. The room also offers a newly renovated stage (a microphone rental is available). Brian and I recently attended a concert there and had a great time! The band was on stage, the dance floor was down in front, and there were plenty of tables and chairs in the room to rest our aching feet in between sets. The atmosphere was lively and fun. In addition to the large meeting/ballroom, a small meeting room adjacent to the full kitchen is also available for rent. There are photos on their website of the room beautifully set up with draped round tables. The Center is ideally located at 5500 Sonoma Rd. on the corner of Old Georgetown Rd. 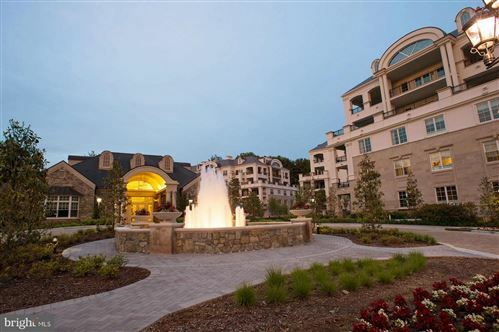 With 50 parking spots, there is ample free parking for your events. Prices vary to rent the small meeting room, large meeting room and/or the whole facility depending on the spaces you need, the number of hours and day of the week. To visit the facility and discuss your needs, they ask you to call ahead for an appointment so as not to interrupt an event. The days of the quiet “burbs” not offering much to do have waned with the onset of the automobile and there is plenty to keep us all occupied and active these days. Unfortunately, Women’s Clubs throughout the country have also waned in their membership and support. The membership is aging and many clubs are struggling with how to attract a younger demographic to carry on their tradition of good times together and good works in the community. But the The Woman’s Club of Bethesda is a wonderful organization with a rich 100 year history in our community that deserves our support. If you are interested in membership, click here for more information.